The sporting disciplines which are being practised in St Vincent and the Grenadines need to be broadened to include others. âWe have to begin to break the boundaries of our own restrictive imaginations… Open ourselves a little more,â Gonsalves stated. In suggesting some of the new sporting frontiers to be broken into, Gonsalves reasoned : âWe have never for years addressed hockey … We have playing fields; I donât see why we donât have hockey and that again is a very cheap sport … We have squash but we donât have badminton …. It is another very exciting sport … I donât see why we canât have gymnasticsâ. The Prime Minister disclosed that with a soon to be developed hotel complex at Peterâs Hope, he could see golf being played on the mainland. 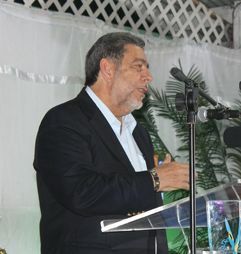 In addressing the disciplines of fencing and shooting, Gonsalves said the platform for the latter exists, especially with the erection of a shooting range at the Arnos Vale Playing Field.